One of the many great things about living in England is be the ability to visit amazing manor homes on a total whim. There is manor after manor, castle upon castle that one can visit here. It has been a real treat being able to visit many of them. One manor I want to share with you is Waddesdon Manor in Buckinghamshire which has been in the Rothschild family for years. It was built in the late 1800s for Baron Ferdinand de Rothschild and what makes this manor so notable to me is fact that the Rothschilds had it built to look like a Neo-Renaissance style French chateau. This could have been a horribly ugly result, I admit, but it is very well done and somehow seems to suit its surrounds perfectly. The impressive Waddesdon Manor in Buckinghamshire. Image from Waddesdon Manor. The fountains outside the main drive up to the manor. Image by Interior Monologue. In the early years, Rothschild family members acquired items made of precious materials which were beautifully crafted. You know I love this, don’t you? As the family began to build and furnish luxurious houses, their collections expanded. Similar tastes united the family and the resulting style became known internationally as the ‘goût Rothschild’ or Rothschild taste. 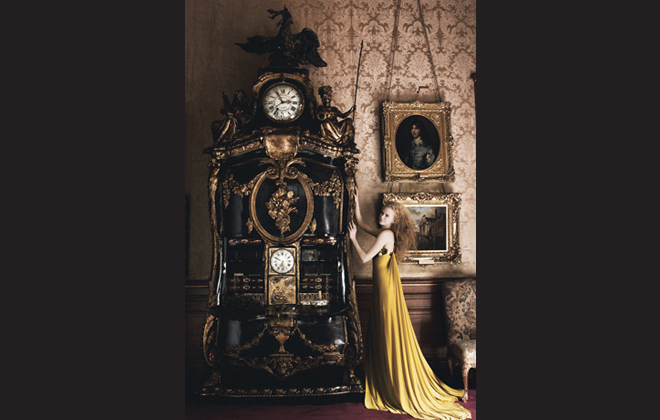 This meant they had an affinity for the unparalleled quality of French 18th century decorative arts, such as furniture, porcelain and textiles. These objects were collected as works of art but also served as useful furnishings alongside 19th century furniture. This is all brilliantly on display at Waddesdon Manor and is one of the reasons I wanted to share this with you. A perfect example of the incredible interiors of the manor. This image is part of a photo shoot for Vogue in 2006 with Nicole Kidman. Another image from Vogue 2006 with Nicole Kidman. The best part of the visit was the dining room at Waddesdon where you turn the corner and are totally surprised by what you see. 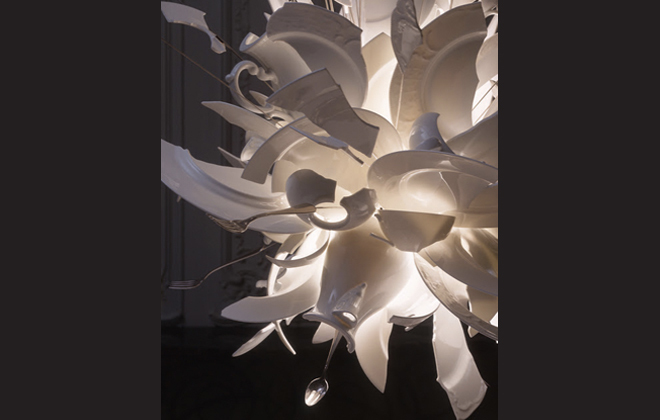 An amazing juxtaposition of old and new because of a chandelier hanging in there made up of broken plates designed by Ingo Maurer titled “Porca Miseria!”. Totally massive and impressive. It was added relatively recently to the house by Lord Rothschild who to this day continues to add to the family’s collection and is an advocate of contemporary art. 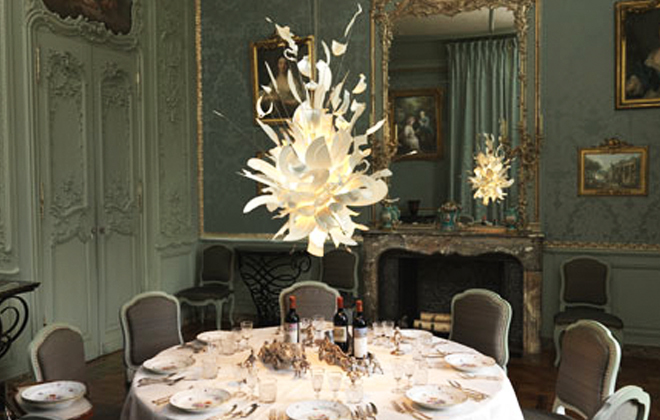 The dining room at Waddesdon Manor with the Ingo Maurer chandelier. 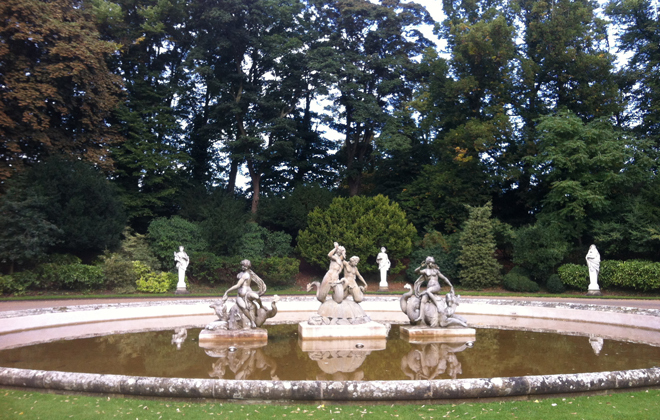 Image from Waddesdon Manor. Ingo Maurer designed this chandelier in 1994 in response to what he felt to be the too slick, overly-designed look of contemporary furniture. Initially, Maurer called this chandelier ‘Zabriskie Point’, after the slow-motion explosion in an Antonioni film that he loved. When some Italians came to its first showing and muttered “porca miseria!” in amazement, he immediately changed the name of the piece to that. Funnily enough, that is a sort of Italian cuss phrase so that makes the piece even more cheeky. I feel like people would shout that and throw plates on the floor…but perhaps that is more Greek than Italian! Perhaps it is only a “Rothschild” who can commission a piece of this magnitude as the Maurer studios only make 10 of these chandeliers per year and they cost upwards of £30,000 each. 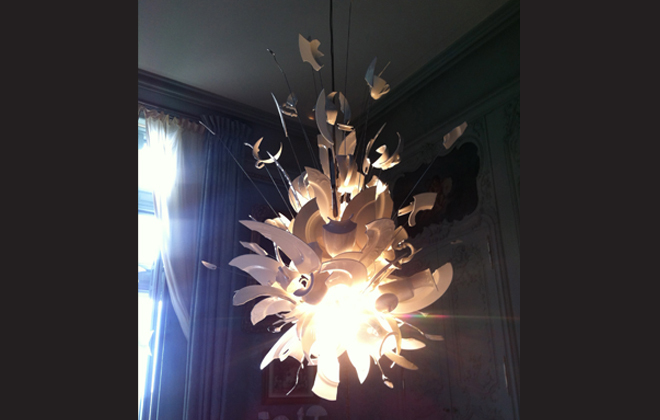 But it is really more of a piece of art than just a “chandelier” with each one being completely individual and handmade. I truly appreciated the juxtaposition of the old dining room with this truly modern piece of exploding art illuminating the room. It was breathtaking and quite a visionary acquisition for Lord Rothschild to have made. Lastly, a bit of trivia for all you Downton Abbey fans. 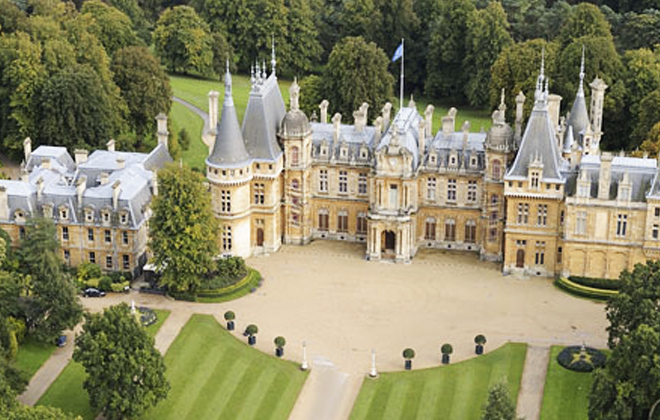 You might recognize Waddesdon Manor since it stood in for the exterior of the fictional Haxby Park in the second season of the series, when Mary and Sir Richard intended to marry and thus look for a house in which they wish to live.